Well, our month has not gone quite as planned so this will be a shorter review and it's later than we intended (my fault completely!). It's wonderful to see the spring and summer recipes featuring seasonal vegetables and fruits! Perhaps inspiration will once again return to kitchens everywhere. FOOD NETWORK (Alaina)- This wasn't my favorite issue of Food Network but still, they have so many recipes and so much variety. The Jumbo Maple Pecan Scone, Poppy Seed Potato Salad, Stawberry Blondies, and Sage Limeade were a few of the recipes that looked interesting and tasty! 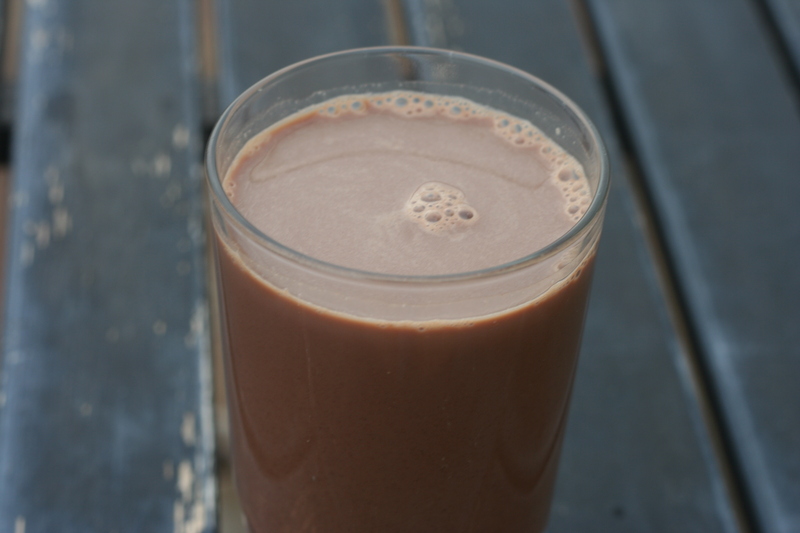 However, my kids are big fans of chocolate milk and it is definitely a treat. So, I decided to make the Salted Chocolate Milk. The homemade chocolate syrup could be used as a sauce for all kinds of desserts. This was rich and delicious! The salt was a wonderful addition that brought out the chocolate goodness. This totally made me feel like a kid again! Make the chocolate syrup: Combine the sugar and 1/3 cup water in a small saucepan. Bring to a simmer over medium heat, then whisk in the cocoa powder until smooth. Remove from the heat and stir in the vanilla. Let cool completely. Spoon about 2 1/2 tablespoons of the chocolate syrup into each glass. Add 1 1/2 cups milk and a generous pinch of salt. Stir until the syrup and salt dissolve. 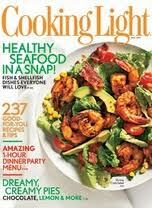 COOKING LIGHT - (Stephanie) I never know each month whether or not I'll find many recipes I'm excited to try within the pages of Cooking Light. This month's issue had several tasty sounding recipes. As I'm trying to learn to enjoy shrimp, I was pleased to find a couple new shrimp recipes: Shrimp Cobb Salad and Roasted Shrimp & Broccoli. There was also a section with assorted muffin recipes--Bacon-Cheddar Corn Muffins, Cherry-Wheat Germ Muffins, Tuscan Lemon Muffins, Pistachio-Chai Muffins--don't those sound interesting and delicious? I also thought the Ancho Chicken Tacos with Cilantro Slaw and Avocado Cream sounded yummy. 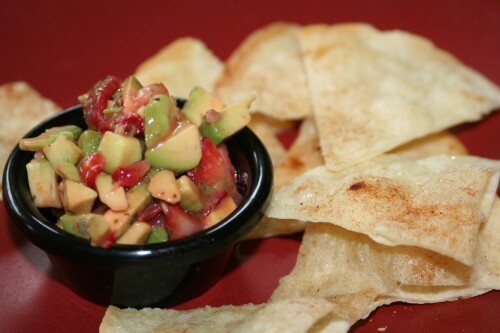 I decided to try the Strawberry-Avocado Salsa with Cinnamon Tortilla Chips. I love fresh salsas and the flavor combination in this one intrigued me. I enjoyed this, though unfortunately forgot to buy fresh cilantro and jalapenos, so I used dried instead. If you're looking for a quick, seasonal snack, give this easy recipe a try. To prepare chips, brush oil evenly over one side of each tortilla. Combine sugar and cinnamon; sprinkle evenly over oil-coated sides of tortillas. Cut each tortilla into 12 wedges; arrange wedges in a single layer on two baking sheets. Bake at 350°F for 10 minutes until crisp. Combine avocado, strawberries, cilantro, jalapeno, lime juice, and salt; stir gently to combine. Serve with chips. 12 servings.